In the grim dark future of the 41st millennium, there is only war. That war now spreads to the Knight world of Alaric Prime as the Red Waaagh! led by Grukk Face-rippa invades the planet. Only the Space Wolves, the Norse themed chapter of the Space Marines, stand ready to defeat the hordes of Orks pouring across the surface. Sanctus Reach is a turn based tactical game depicting the campaigns fought in that war, at the scale of individual squads, vehicles, and weapons teams. Sanctus Reach is the latest strategy title from veteran wargame publisher Slitherine, however, the developer is the rookie studio Straylight Entertainment. While I'm not privy to exactly how the Slitherine development process works, it is clear that Sanctus Reach draws heavily from other recent Slitherine productions. Fans of Battle Academy 1+2, Pike and Shot, or Sengoku Jidai will immediately feel at home in this game, as the controls and interface are very similar. Notably, this is the second Warhammer 40k title from Slitherine, with the first being WH 40k: Armageddon, which drew a great deal of its design influence from Panzer Corps, as opposed to Battle Academy. Now, enough with the pedigree, let's kill some xenos scum! Space Wolves vs Orks. There will be blood, lots of it. One thing is immediately apparent upon playing Sanctus Reach for the first time: this is, by a mile, the best looking 3D game that Slitherine has ever published. The units are highly detailed and smoothly animated, rivaling or besting those seen in screenshots for the upcoming Dawn of War 3. While the units will spend most of their time standing around waiting for their turn to fight, they will look fantastic doing it. The combat is also far bloodier than one might expect from Slitherine. Blood gushes out of units with each hit, and Orks often explode into chunks of meat when killed, accompanied by appropriately gruesome splattering sound effects. Think chunks of wet meat being thrown against a wall. Speaking of getting into the fight, let's jump right into the meat of the game, the combat itself. While there have been many recent titles set in the Warhammer 40k universe, none have really come close to depicted the table top game itself. No doubt Games Workshop is leery of letting a PC game exist which mimics the exact gameplay of their flagship product. Why would anyone spend a small fortune on models, paint, and rule books when they could just fire up a PC game that gave them the same experience? Having never played the table top game myself, I won't attempt to make a direct comparison, but certainly Sanctus Reach comes closer than anything else seen before. 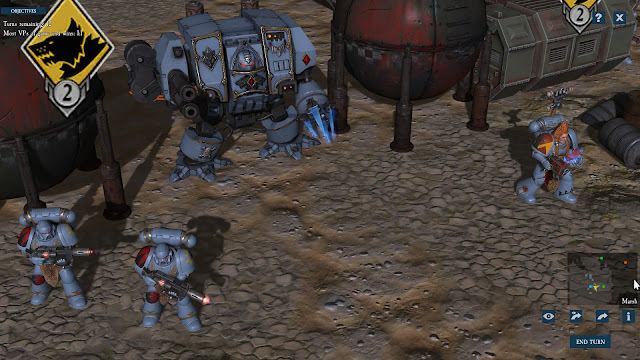 If the game spawns a series of DLC and expansions like Armageddon has, we could be looking at the go-to game for Warhammer 40k fans seeking a digital turn-based fix. The combat in Sanctus Reach takes place on a square-based grid which stretches across bleak and ugly (in a good way) locales dotted with ancient ruins, dead forests, human military bases, industrial centers, and Ork encampments. Terrain can play a key role in strategy, as many objects provide cover from ranged fire, while others block line of sight entirely. With each faction fielding many melee focused units, careful positioning around various objects is critical to holding the line and keeping the squishier ranged units safe. Each side in this conflict actually has 30 different units available, each with a distinct role to play on the battlefield. On your turn, every unit can be activated in whatever order you choose. Each unit can attack twice, move a certain number of squares, and in some cases utilize a special ability. Once all of your units have been exhausted, your opponent gets a chance to go. This style of gameplay is a tried and true one, and it gets a few new tricks in Sanctus Reach. The facing of every unit can be adjusted before ending your turn, and you will want to do this carefully, as each combatant gets one free reaction shot against enemy units moving into its line of fire during the opposing player's turn. On your turn, you will be warned about these reaction shots by seeing the movement grid turn red in spaces where the enemy could get a free shot. Facing is even more important for vehicles, as their armor is usually weaker on the sides and rear. Helpfully, the facing of the hull and turret can be set independently for some vehicles. Unit morale is a factor in the combat as well. An important early tactic for keeping the swarms of weaker Ork units at bay is to hit them with the flamethrower unit, which does good damage across a wide area but more importantly causes a massive drop in morale for any units caught in the flames. This makes it easy for your other units to mop up without much fear of reprisal. Morale matters less for the Space Marines themselves, however, since they will almost always die fighting long before they panic and run. I expect if there is an Imperial Guard campaign in the future, the player will have to pay much more attention to this value. The Orks have all sorts of nasty toys on hand. With all of the different unit types available for you and the enemy, you must be deliberate with each decision. Rushing a unit forward to finish off a foe could leave it vulnerable to being surrounded on the enemy's turn. On the other hand, setting up an ambush, with multiple units' reaction fire targeting a likely approach, could net you a free kill. You must always consider strengths and weaknesses of unit types as well. Meltagun infantry are awesome at taking down armored units and vehicles, but are completely useless in a close up brawl. Flamethrower units can send packs of Orks running, but hardly scratch even the lighter Ork vehicles. 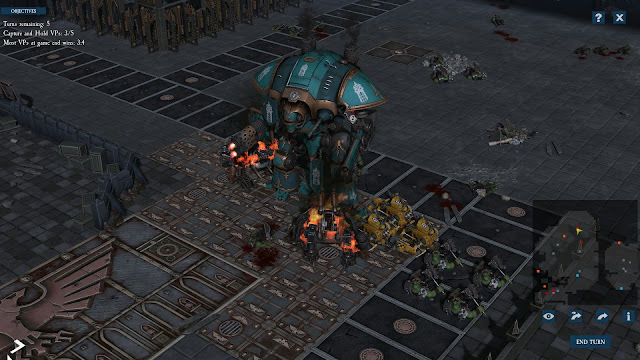 This is one of the most enjoyable parts of Sanctus Reach, fielding a balanced mix of units and utilizing them in the most efficient way possible. You will need to be efficient, because the Orks vastly outnumber the Space Marines in every scenario. Against these mobs of greenskins, sloppy tactics will get your force wiped out in a matter of a few turns. More than once I saw the first wave of the enemy approaching and thought that there was no way my little army of Space Marines would survive. However, by employing solid tactics I could (usually) scrape out a victory or even turn the tide and mercilessly slaughter the fleeing Orks. The larger battles are particularly engaging, as you are often forced to spread your forces out to different hot spots at the same time. Choosing where to send your best units is always a challenging decision. Scouting units even manage to play an important role at times. Getting a couple of turns warning to shift your defenses, or knowing exactly how many units you will need to take a victory point, is always useful and could make the difference between victory and defeat. This game achieves one thing in particular, something that is important in any strategy game, and that is feeling a sense of satisfaction when your forces are pulling ahead in the fight. In almost every mission of Sanctus Reach, you will be faced with large groups of greenskin units rushing at your brave Space Marines. There is tension and a sense of imminent peril in these moments. However, make the right choices, put your men in the right places, and you will be turning green Orks into red chunks left and right. What was once a deadly horde is now scattered and fleeing before your soldiers, and it feels great. The game's AI does a good enough job leading its forces most of the time. That's not saying much considering the lore accurate tactics for Orks is to simply have them attack, attack, attack. However, you will find that the AI can give you a good run for your money if you aren't paying attention. It will focus on an exposed unit, or ignore a unit it can't really damage to rush past towards one that it can. At other times though, the AI seemed indecisive, and would have a few units uselessly meander around at the edge of a battle. I found that there were a few balance issues in the build I was playing, but the developer notes indicated that they were still tweaking things, so I won't knock the game for that. In particular, the Ork Battlewagons seemed grossly overpowered, able to often kill entire Space Marine squads in one turn from a long distance, while being almost indestructible. I also encountered a few bugs and minor annoyances like the camera not being able to pan far enough to see the entire field at certain zoom levels and other minor UI glitches. These all seemed like small issues which could be cleaned up in short order. At no point did the game crash or show signs of anything less than silky smooth performance. On the whole, I think this engine fits Warhammer 40k quite nicely. The combat is at that sweet spot of squad-level maneuvering where you get a bit of that X-COM tactical feel, but on such a scale that every battle feels like an important struggle. It also is granular enough for it to make sense that your hero units are running around on their own, using special abilities and taking on entire Ork squads alone. The system definitely has the flexibility to allow for the other factions of the 40k universe to make an appearance in the future. Other factions will necessitate different tactics, which will only enrich the experience on offer here. While Space Marines can hold their ground against most any Ork unit, an Imperial Guard army would need a lot more artillery backing up their lines of numerous, yet weak troopers. An Eldar army could be especially interesting to play, using hit and run tactics to pick off exposed units, without the need for the frantic mouse clicking and micro-management of an RTS. There are a lot of possibilities to be explored here. I expect that this game already has an extensive list of DLC and expansions lined up for production, and I think it will do well in the long run, but there are some rough edges that need smoothing out in the meantime. The Space Wolves prepare to attack. There were many instances in this game where I felt like a feature was done well in one way, but fell short in another. For example, when your Dreadnought units move, each step causes the camera to rattle just a bit, adding some real weight to the footfalls, but, those steps don't leave any kind of footprint on the ground or kick up dust. Many objects like walls and barriers can be destroyed by manually targeting them, but not even your flamethrowers can get rid of a dead tree blocking your line of sight. Melee combat has some impressive gore effects and Ork heads rolling on the ground, but the actual attack animations don't have that much variety to them. I realize this is an effort from a smaller studio, but everyone knows the fun of Warhammer 40k is 50% about the spectacle of over the top carnage. The ranged attack animations and effects are generally better, especially for the flamethrowers and explosives. Also, did I mention how good the blood and gore is in this game? It's really good, and you will see it often. Sound is certainly a mixed bag as well. Some weapons, like the missile launchers and flamethrowers, sound great, while others, like the meltagun or bolters, sound downright puny. There were also a couple of sound effects which seemed to be completely missing. The music is adequate, dark and moody, but as far as I could tell there were only a couple of tracks, or they all sounded exactly same. There is one major feature of the game that I feel falls into this mixed bag category as well. The campaign structure itself. On the one hand, you get two lengthy campaigns with a lot of missions, but many of those missions are just random skirmishes. These skirmishes have no flavor to them really, which isn't that bad on it's own, but you are forced to grind through three of them between each story mission. I feel like there was so much more they could have done with these missions. Perhaps have the player choose two out of three missions, with each one offering some kind of bonus for the coming set-piece battle, or adding a unique unit to the available roster. Or, throw in some kind of gameplay altering rule change or unit limitation in a skirmish to force a change in tactics. As it stands, these missions are simply filler, there to lengthen the campaign and not much else. The unique story missions are much more interesting. These have you fighting through some kind of specific scenario, such as assaulting a fortress, escorting transports, or fending off an Ork ambush. Later in each campaign you get the chance to take on the big baddies of the Waaagh! Actual screenshot from my PC. These are some good looking Space Marines! One cool aspect of the campaign is that your units persist from mission to mission and gain experience. When they level up they become more powerful and can gain new abilities. This of course gives you an incentive to keep them alive and get as many kills as possible. I also liked how every unit has an individual name, letting you grow more attached to them over time as they purge xenos and live to tell the tale. As units grow in abilities, you gain a lot more options in how to fight. There are all sorts of grenades and other items that put different effects on enemy units, like stunning them or dropping morale. Units can also get buffs to attacking particular enemy unit types, like vehicles. As you face larger groups of enemies, using these abilities to the max becomes critical to your survival. Now I must come to my single greatest letdown with this game: There is not nearly enough "fluff" for my tastes. You know, that part of any Warhammer 40k game or book where the characters talk about purging and cleansing and dying for the Emperor? You get only just a whiff of it here. The story is told through mission briefings that are, at best, one paragraph long, and seem to assume that you already know who the characters are and what they are doing. For example, the description for the first campaign describes your unit commander impatiently launching his forces towards battle on the planet below, then picking up a distress signal on the way down. Great, sounds interesting! Then you launch the first scenario, which has your forces defending a crashed Thunderhawk, with the objective to capture a nearby communications tower. How did we get here? I guess the ship was shot down, the game doesn't take time to explain. Why do we need to reach that communications tower? Because the mission briefing says so. Oh, okay, I guess. Do we get an explanation of the situation once the mission is completed? Nope, nothing at all. This pattern continues through each campaign. It feels like there is a story going on, but it is told through the briefest of dialogue snippets. Don't forget the three skirmishes between each unique scenario, which have no specific context at all, and spread the 40k butter far too thin. The level design of the "set-piece" battles is often interesting, and the scale ramps up until you are fielding massive forces and wreaking havoc on the Ork horde with all sorts of fun toys, but, rarely does it seem to have much of an overarching purpose. I have to compare this with Warhammer 40k: Armageddon. As mentioned, this was another title published by Slitherine that came out a couple of years ago. One of the most well regarded features of that game was the lengthy and well voice-acted dialogue that occurred before and during missions. The tutorial campaign alone in that game was five missions long and used that time to introduce and develop various important characters, while building up tension towards the start of the actual campaign. Events would routinely occur in the middle of missions, potentially changing your objectives, with characters popping in to comment on what was happening, and sometimes even offering you a choice in how to proceed with the story. There are characters in Sanctus Reach, there is the extensive lore of the Space Wolves, and there is some kind of ongoing story about the battle for Alaric Prime, but it is all referenced in the barest of detail. In Armageddon, you really felt like your forces were fighting in a grim war to save the planet, with the story dictating your goals from mission to mission. I did not get that feeling from Sanctus Reach. The actual gameplay within the missions was fun, but at the end of each one you simply get a screen saying you won, with no narrative follow-up at all, then it's straight back to the mission selection screen. It's a very anti-climatic way to end even the most exciting of battles. Armageddon did it so much better, and any future campaigns for Sanctus Reach or its sequels should take a note from that playbook. Okay, with that done, I would like to hit on a couple positive notes before wrapping up. The Imperial Knight in its natural habitat, knee deep in Ork corpses and wreckage. Multiplayer. I wasn't able to get in a multiplayer match of Sanctus Reach, but it works exactly the same as Battle Academy, which I have played online quite a few times. The game uses Slitherine's excellent automated PBEM system, which allows players to play without needing to both be on at the same time. You can set up a game and then wait for someone else to come along and accept your challenge. Then you take your turn and wait for the other player to take theirs, without needing to keep the game running if you aren't both playing at the same time. This means you can even have multiple games going simultaneously. Just log on at your convenience, play your turn for two or three or more matches, then log off and come back later. In multiplayer you will get the chance to try out the Orks for yourself, which should offer a sharp change of pace from how the Space Marines handle. I really look forward to seeing how future content will expand this area of the game. Hopefully we will eventually get access to a few more factions like the Imperial Guard or other Space Marine chapters at the very least. The potential is there to some day have a game using this engine where the Tau, Tyranids, Eldar, Orks, Chaos, and more can face off in online turn-based matches. This could be the "killer app" for Slitherine if that happens. Editor and Mods. It's hard to say at this point what people will make, but if Battle Academy is any indication, you can expect to see a lot of new maps for multiplayer and single player becoming available over time. On the mod side of things, even though modding is mentioned in the manual as being supported, I can't imagine that Games Workshop would allow people to run wild here. Too much freedom would let people create rules closer to the tabletop experience, or even add in new factions. I'm not sure what will be possible, but I look forward to seeing what people create. Ultimately, what we have here is a very good game that forms a solid foundation to build upon. The bar has been set with excellent graphics and animations, the combat engine is a proven one that is flexible enough to handle everything the 40k universe can throw at it, and the publisher Slitherine has a well-earned reputation for supporting titles long after release. Despite the disappointing campaign narrative (or lack thereof), I found that the tactical combat itself continued to grow on me the more I played.The multiplayer combat has the potential to be a serious draw for many players, especially as more units and factions are added to the game. Sanctus Reach is right there on the edge of being a runaway hit series if they can fill in just a few gaps. Thanks for the review... This game is at the top of my list! No wonder this post has had so many hits. Topic bound to draw attention, but an excellent review, full of information and well balanced, pointing out the pros & cons. This is my sort of PC game. Great Job, Joe.